By Andrea J. CookJust one year after a fire destroyed the Wounded Knee Museum in Wall, it has reopened in a new location with new stories to share. It was on the night of Sept. 2, 2012, when museum co-founder Steve Wyant saw a dream that had lived on for 10 years go up in flames. An electrical malfunction was blamed for the fire that also took 30 exhibits linked to the Wounded Knee massacre on Dec. 29, 1890. "Insurance never even came close," Wyant said of the daunting task of bringing the museum back to life. But there were precious items that did survive the blaze that today fill a new museum in downtown Wall. They also instill a sense of awe in Wyant, who marvels that they survived a fire that spared so few items. "I'm always touched by the thought of it," he said of the collection of nearly 300 simulated eagle feathers suspended from a Lakota Medicine Wheel. Each feather represents a one of the 300 men, women and children killed by Seventh Calvary soldiers on that day.Comment: Apparently Wyant gave no thought to moving his museum closer to Rapid City, Pine Ridge, or Wounded Knee. I.e., the places anyone interested in Wounded Knee would go to first. Too bad. 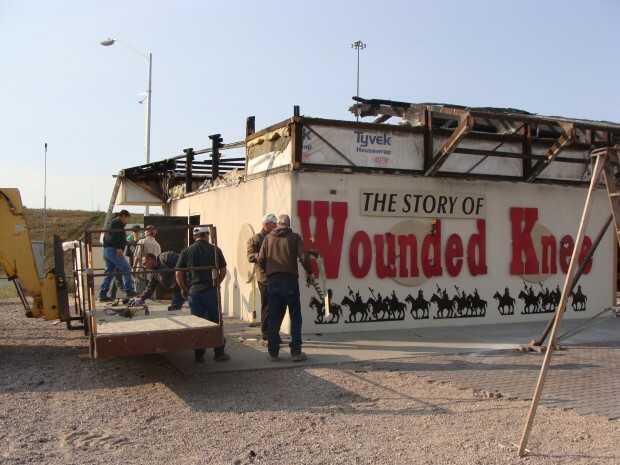 For more on the Wounded Knee Museum, see Fire Totals Wounded Knee Museum. Below: "Last September, an electrical fire destroyed most of the artifacts and collection in the Wounded Knee museum in Wall. A year later, owner Steve Wyant has rebuilt his museum in a new space in downtown Wall."